Why not use safe & effective, household/food grade, undiluted "5% Vinegar" to control plant growth on streets, sidewalks, and around park facilities, instead of using toxic chemicals, such as Roundup's Glyphosate? Ask Mayor Kenney and City Council for Freedom from Toxic Herbicides! Hi everyone – As we near Fourth of July weekend 2017 I’m asking you to contact Mayor Kenney and City Council to ask for freedom from Roundup and other toxic herbicides used in Philadelphia’s schools and parks. The science has been clear for decades - that Roundup is toxic to people and the planet. Why are we allowing the spraying to continue? The good news is that the city is experimenting with using undiluted 5% household vinegar instead of commercial herbicides in one district, which was in response to a successful experiment we conducted last year at Boelsen Cottage in Fairmount Park. The bad news is that you will never know where Roundup has been used in all the other parks, so that people, pets, and wild life remain at risk. Mayor Kenney and City Council might also want to know the following. The GMO crop idea is to spray the entire field with Roundup to kill weeds, while the GMO crop still stands. Transnational biotech corporations develop and sell both the GMO seeds and their accompanying herbicide. (Monsanto manufacturers Roundup and Roundup Ready seed.) In 2016’s growing season in the US, 94% of soy, 92% of corn, 95% of canola, 89% of cotton, and 100% of sugar beets were genetically engineered to be herbicide tolerant. (Corn and cotton are also engineered to secrete insecticide from every cell.) Overuse of the same herbicide has caused the problem of immune “superweeds,” which now infest 75% of commodity farm fields. This phenomenon has triggered a spiral of increasingly toxic herbicides applied to crops; a sort of pesticide versus weeds arms race. Airborne herbicides and gene-altered pollen threatens wild plants, non-GMO crops, and organic certification of farms. Pesticide toxins (including neonicotinoid insecticide GMO seed treatment coatings) have destroyed soil fertility, caused widespread water pollution, genetic deformity of amphibians and fish, and massive colony collapse of pollinators (bees, butterflies, and birds). In 2016, Phila City Council passed unanimously a resolution calling on the federal government to label genetically engineered food. The resolution was introduced by Councilwoman Blondell Reynolds-Brown. Organic farming yields greater quantities and more nutrient-dense (and flavorful!) food. For now, the USDA organic standards still prohibit any genetic engineering in certified organic fresh or processed products. Photos above taken Sept 18, 2016. Dear Mayor & City Council – It has been almost 2 months since I wrote to you about Kelly Drive, Martin Luther King Drive, and many other parts of Fairmount Park that were sprayed with a toxic herbicide. 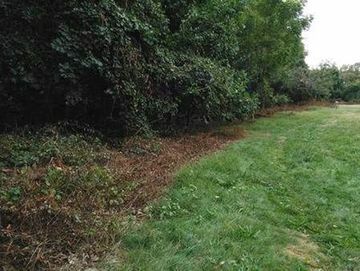 As you can see from the photos below (taken two months apart), the result continues to be an unsightly and unhealthy situation for people, pets, and nature in general. These dangerous chemicals get tracked inside homes where children and pets play on the floor. Also, people may nibble on a wild berry or eat a dandelion, not realizing that it’s been sprayed with toxic chemicals. So, I am once again encouraging the city to ban any future use of toxic herbicides as a way to control plant growth in the city of Philadelphia. As I recommended in my first email, it is best to use a machine or manually trim along a tree line. Many important plants, bushes, and trees thrive along the tree line and supply food for birds, bees, and other wild life, therefore any type of herbicide is not appropriate. However, to keep plant growth away from buildings, streets, and sidewalks, it is best to use 5% vinegar (food grade and undiluted). Vinegar works as well, or better, than Roundup and without its harmful consequences. For information on toxic herbicides and safe substitutes, please visit http://www.healthalertphilly.org/ToxicFreeParks.htm. I should also add that it appears that the state has been spraying all along the Schuylkill Expressway with similar unsightly and unhealthy results. Thank you for your attention and please let me know what I can do to assist in this matter. Dear Mayor & City Council – Please put a stop to herbicide spraying in Fairmount Park and throughout the city. 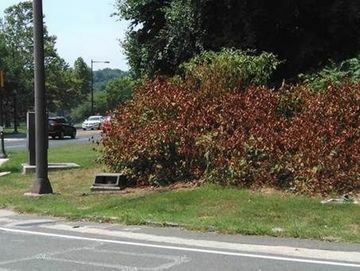 In a week that should showcase how beautiful our city can be, the photo below of dead vegetation due to spraying is what visitors to Fairmount Park are seeing today - all along the east side of Kelly Drive and in spots on West River Drive. I don’t know who is responsible – the city or state – but whoever it is, they should be stopped from doing this ever again. I don’t know if the spray that was used was toxic Roundup or something safe, but most people will assume it is a toxic herbicide. 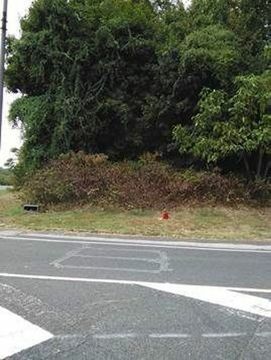 Which is why the vegetation should be manually cut back and not sprayed with anything. In addition, as the founder of HealthAlertPhilly.org and The Wild Foodies of Philly (www.wildfoodies.org), an educational meetup group who studies the edible, medicinal, and other uses of wild plants, herbicide spraying puts at risk the health of people, pets, and nature. Thank you for your attention and my best to you and city council. Gut-Wrenching New Studies Reveal the Insidious Effects of Glyphosate: http://articles.mercola.com/sites/articles/archive/2014/04/15/glyphosate-health-effects.aspx#! Aug 30, 2016: Monsanto Mistake Spawns Widespread Crop Losses - https://www.organicconsumers.org/news/monsanto-mistake-spawns-widespread-crop-losses After two decades of planting glyphosate-tolerant crops, resistant weeds have overtaken farm fields across the U.S., leaving farmers to battle an increasingly difficult situation. At least 35 weed species are now resistant to glyphosate, the primary ingredient in Monsanto's broad-spectrum herbicide Roundup.Studies have also linked glyphosate to increases in Sudden Death Syndrome (SDS), a deadly plant disease that causes plants to turn yellow and die — including crops that have never been sprayed with the herbicide but were planted in a field that received an application the previous season. Instead of open flame, Swiss made "Infra-Weeders" use propane to produce 1800º of radiant heat that 'cooks' weeds away! The"Dandy Destroyer" has a two-inch round spiked head that you plunge into the hearts of dandelions and similar long-rooted weeds to send them to their Eternal Reward. The "Eliminator" withers weeds in patios and walkways with a 3 x 7 inch heated plate. About $200 apiece (American)from the Canadian company Ritten house; on the web at www.rittenhouse.ca. A POWERFUL herbicide! (So be careful not to splash your 'wanted' plants!) You can just fill a spray bottle with regular old white vinegar and spritz away, or use products like "BurnOut Weed Killer"from St. Gabriel Labs (800-801-0061; www.milkyspore.com). The original version-a mixture of vinegar and lemon juice-was very effective. "BurnOut II" (the sequel!) also contains clove oil, which they say makes it even better.